The Rev. James Flavin blessed a 14-foot cross before it was hoisted atop Our Lady of Good Voyage. In the shadow of the One Seaport Square development, just audible over the cacophony of construction on the South Boston waterfront, the Rev. 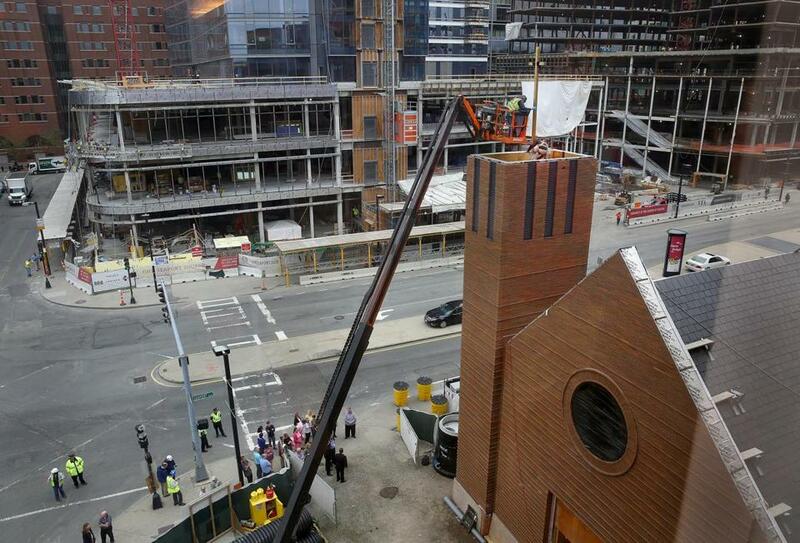 James Flavin blessed a 14-foot cross before a crane hoisted it atop the new Our Lady of Good Voyage Seaport Chapel. And, in Boston, few places seems busier than the South Boston waterfront, where towering cranes and scaffolding signal a neighborhood amid immense change. Flavin said that after Seaport Square is complete, the sidewalk in front of the chapel, at Sleeper Street and Seaport Boulevard, will host an estimated 100,000 passersby each day. “Who would have thought, five or 10 years ago, that this would be possible?” said the Rev. Stephen Madden, the pastor at South Boston-Seaport Catholic Collaborative, which staffs Our Lady of Good Voyage. “It’s another step forward, raising the cross while they’re raising all these buildings,” Madden said, gesturing to the surrounding construction. 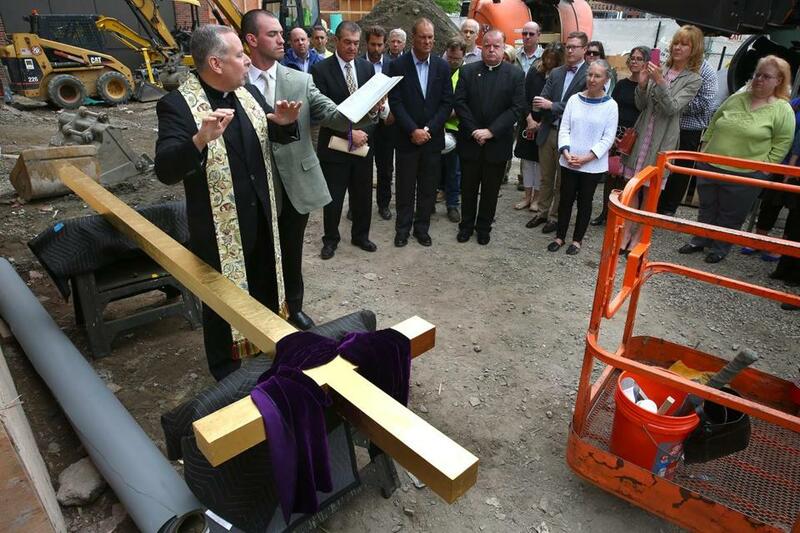 The blessing and raising of the cross is the most recent step in the parish’s transition from nearby Northern Avenue. The church is operating out of its Northern Avenue building until the completion of the new chapel, which is expected in the first half of next year. Javier Soegaard, pastoral associate for the South Boston-Seaport Catholic Collaborative, said he hopes the chapel will attract some of the neighborhood’s new workers and residents. After all, Soegaard said, Our Lady of Good Voyage has always been considered a worker’s refuge. And, Soegaard said, that is exactly what Cardinal Richard Cushing envisioned when he commissioned the construction of a chapel in the Seaport, for the city’s many dock and railway workers. It opened in 1952 and, for decades, served a largely blue collar congregation. Local 7 ironworkers Kevin Danis (top) and Tim Faherty lowered the cross into its support. The Northern Avenue building reflects these humble beginnings. The building is stout, made of brown brick with a small stone cross above the entrance. Inside, there is a nautical theme, and one stained glass window depicts a sailor. A statue of Mary as Our Lady of Good Voyage — it depicts her holding a ship — stands in an alcove near the door. The statue is one of the few items that will follow the church to its new location, a similarly humble building that contrasts with the opulence of the Seaport Square development. The old church will be demolished. Lori Rainchuso and her family began attending Sunday Mass at Our Lady of Good Voyage shortly after moving to the Seaport a year ago. In an e-mail, she said she was sad to leave the historic chapel, but looks forward to continuing to be in the middle of the lively district. When dock and rail workers frequented the chapel, Madden said it provided a haven from long workdays. But the neighborhood is changing. And, Madden said, that change plays out in his church’s pews, with people who live in million-dollar condos sitting beside people who live in public housing developments. Whether the congregation is rich or poor, Madden said the mission of Our Lady of Good Voyage will remain the same: to build community. Reis Thebault can be reached at reis.thebault@globe.com. Follow him on Twitter at @reisthebault.